PGT® Vinyl Windows: PGT® Windows and Doors can not only provide protection against intruders and hurricanes, but can also lower energy costs, reduce noise, filter out 99% of UV rays. Sun Barrier Products installs high quality vinyl windows that are available with both non-impact Energy-Vue and Winguard impact-rated glass, and many other options. PGT® Sliding Glass Doors and French Doors: New Energy Vue and Winguard Vinyl Sliding Glass Doors and French Doors are Energy Efficient and offer a beautiful look for your home. 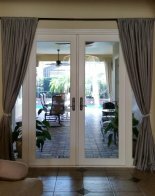 French Doors include European style integrated security hardware. Sliding Glass doors include heavy-duty tandem wheels for ease of use. Provia™ Entry Doors and Storm Doors: Sun Barrier Products is proud to offer Provia™ Door Products. Provia™ Door is committed to manufacturing only the most professional doors that can be individually customized for durability, security, and energy efficiency. Provia™ offers Signet and Heritage style fiberglass doors and Legacy steel doors with a wide variety of styles, decorative glass, colors, and hardware styles.